Although I have more of a casual vibe at work, sometimes I have to dress up a little for meetings or if I'm working with clients. One of my go to outfits is to pair a blazer with a lightweight blouse. 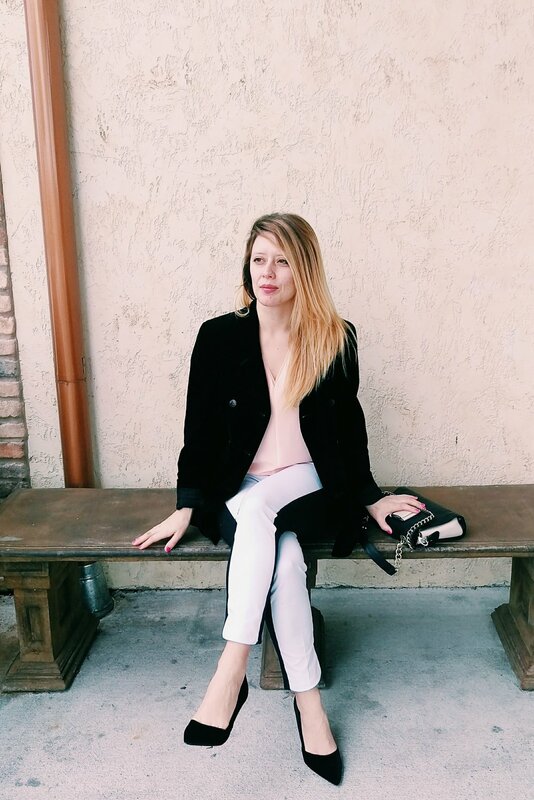 The classic black velvet blazer is a perfect choice for Fall, Winter and even into the cooler parts of Spring. It's easy to change out my blouse and carry it from season to season. My trick is to wear a lightweight top underneath so I don't feel bulky and it's more comfortable to move around. A Velvet blazer and black pumps are classic choices that will work with most office wardrobes. If you purchase good quality items, you'll be able to wear them time and time again over the years! Also, every woman should have a pair of black pumps in their closet. I really like the luxurious fabric of velvet and found that these worked nicely with the black blazer. I found a few other options here, here and here - all under $60. If you are on the Northwest side of Houston and headed out to Cypress, stop my Marvino's Italian Kitchen. Both times I've eaten there I've had really great service and the food was delicious. Locally owned and operated, they provide an authentic Italian surf 'n turf menu. It's an easy to access location and beautiful atmosphere (feels like you are transported to wine cellar in Italy). The family owns a few restaurants in the area and I can't wait to try their new cafe Galiana's opening soon. You can add pops of color like a blush top underneath for added interest. As the seasons change, just switch out the color of your top.